My Newest DIY Birdbath Has Something to Hide! I have several birdbaths in my yard and all but one is a simple inexpensive DIY version. You really don’t have to spend hundreds of dollars to offer birds water. Most of mine are simply large plant saucers from the local home improvement store that I set on the ground and keep filled with water year-round. (In the winter, I add a heater to one of them.) But I decided recently to create one more. This one actually has a base so that it sits higher . . . and it has something hidden underneath it! This spring, the now exposed well head was staring out of the garden at me. I decided instead of trying to hide it behind another bush, that I’d instead hide it a little more thoroughly but so that it could very easily be uncovered as needed. I decided that I could make it functional by hiding it inside of a DIY birdbath. I’ve really pleased with the result and so have the backyard birds. To make the birdbath, I went to my local home improvement store (Lowes) and bought a pot tall enough to sit upside down over the well head and a saucer to set on top of this. The pot itself didn’t come with a saucer, so I needed to buy one separately. I chose a resin pot instead of ceramic or terra cotta so that I can leave them out in the winter without having to worry as much about it cracking in the cold. I spent about $19 on the pot and another $7 on the saucer. 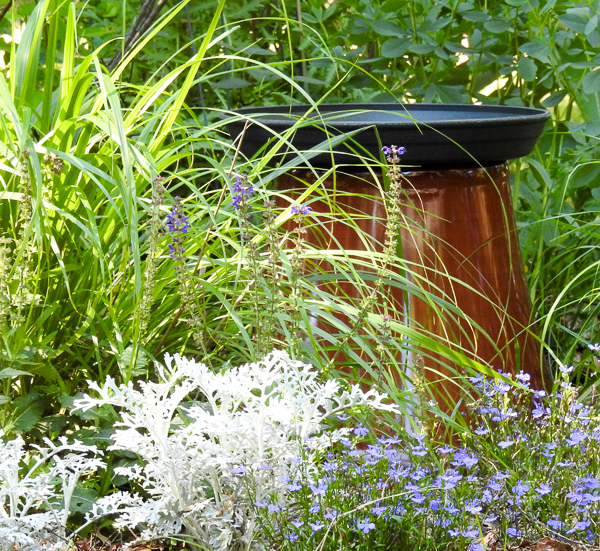 The birdbath is very lightweight and so very easy to move. The pipe hiding underneath should keep the pot from blowing in strong wind. (If you don’t have a well head to hide, you could put something heavy like a rock inside if you are worried it might move in the wind.) The weight of the water keeps the saucer in place. It always takes birds a little while to find something new in the yard. 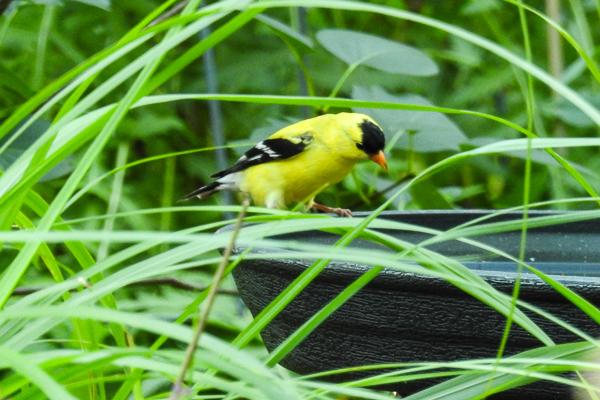 I didn’t see the birdbath get any business on the first day or two but since then, I’ve seen American Goldfinches stop for a drink on the way to their feeders around on the other side of the house several times, the occasional Mourning Dove and a group of House Finches. The smaller birds seem to like the little lilac bush near the bath as a place to perch before they drink. We have very aggressive mosquitos, so I am extra vigilant about not letting water stand outside for too long. I usually refill my birdbaths at least every two to three days (more often if the water gets dirty), which keeps the water clean for the birds and keeps the mosquitos from using the water to host their egg production. My new birdbath is simple. I like it. I think it fits the style of our yard. 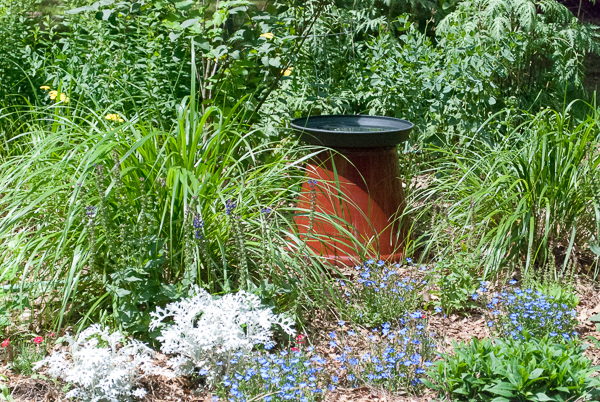 If you have a more formal yard, you could of course make one with a fancier looking pot. And you don’t even have to hide something under it! 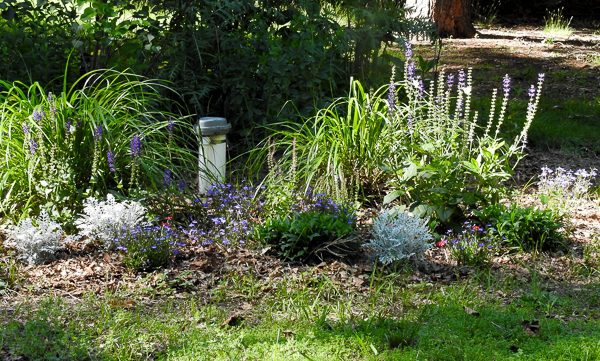 Does Your Hose Provide Clean Water For Your Birdbath?